Are you looking to save cooking time, save energy and protect your cooking surfaces? Then our 12 quart sous vide neoprene cooking container sleeve is the right fit for your kitchen! Now get even MORE from your sous vide cookers. Cook faster and more efficiently just by slipping our premium grade neoprene sleeve onto your cooker. Because each sleeve is so good at heat insulation, it helps reduce evaporation that leads to lower water levels. Any experienced sous vide chef knows that water levels are essential to a well cooked meal. Make it easier for yourself and spend less time babysitting your cooker. We all know how marble, granite and other kitchen countertop surfaces pull heat away from your sous vide cooker. Our neoprene sleeve is designed to insulate from those cold counter surfaces so that the water reaches (and maintains) its proper cooking temperature faster and more efficiently. Plus the sleeve cushions and protects your countertop from scuffs, scratches and excess heat that can damage the surface. Anyone who likes to cook in the sous vide style can use this to create faster, healthier and more delicious meals...no matter their experience level. Join thousands of happy sous-viders, cooks, chefs and customers...Click ADD TO CART and orderTODAY! ✅COOK FASTER & EASIER - Sous Vide cooking is fun, efficient, and creates delicious meals...and it just got even easier and faster to do! Our 12 Quart sous vide neoprene sleeve allows you to make the most out of your WyzerPro WPC12 sous vide container by providing better heat insulation so that your food can cook even faster and more efficiently. ✅PROTECTS KITCHEN SURFACES - Each premium neoprene sleeve helps cushion your container against all your kitchen surfaces. No more scratching or scuffing your granite countertops, wooden tables, or delicate stove top cooking surfaces. It doesn't only protect kitchen surfaces, it also protects your sous vide container from getting banged or hit while you're busy making delicious recipes. 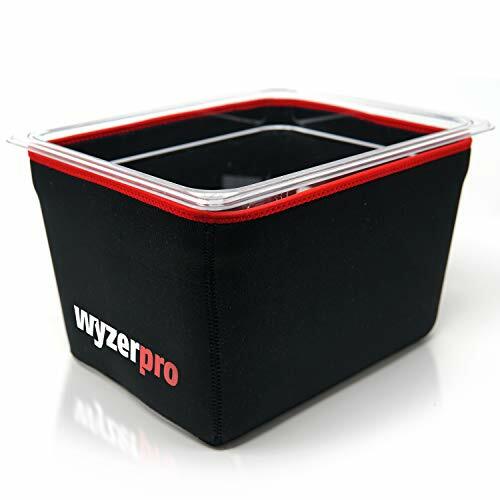 ✅SAVE MONEY - Because our neoprene sleeve provides better and more efficient heating insulation for your WyzerPro WPC12 sous vide container, it helps reduce heating time. That's awesome because it cuts down on electricity use which saves you money and is easier on your home's electric infrastructure and monthly electric bill. ✅PERFECT FIT & BETTER GRIPS - Our premium construction neoprene sleeve is a perfect fit for the WyzerPro WPC12 sous vide container. It easily slides on but will stay put and won't slip off. It gives you better grips, which is great because you're less likely to drop or damage your cooker during prep and clean up. Can even fit other similar sized 12-quart containers. ✅FULL 3 YEAR WARRANTY - We stand by the quality and construction of our premium neoprene sleeve. It won't break down even when exposed to high heat and regular use. We offer a full Three Year Warranty on every single sleeve, so if you have any issues, problems or concerns then simply contact us and we will make the issue right. If you have any questions about this product by WyzerPro, contact us by completing and submitting the form below. If you are looking for a specif part number, please include it with your message.